Recently, I attended Chester Comic Con and had the pleasure of meeting Batman and 2000AD artist Dave Taylor. Dave kindly agreed to be interviewed by The Comic Vault. He’s been in the industry for a number of years, drawing for DC, Marvel and indie publishers. One of his most well-known graphic novels is Batman: Death By Design. 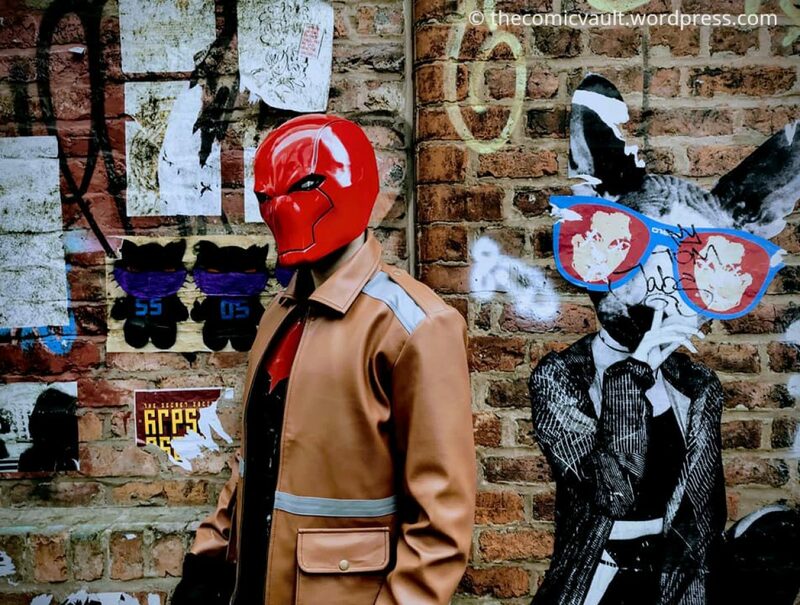 Read on to find out how he pissed off die hard Bat fans and why he feels it’s never been a better time to be an indie comic creator. Are you quite active on the English comic con circuit and do you try to make time for American cons as well? I try to do a few UK cons a year. It can be a lonely business, sitting drawing in my bunker all day, so it’s nice to get out and meet the fans and catch up with fellow creators from time to time. I used to attend the San Diego con every year but haven’t returned for a while. What was your first experience with comics and did you always see yourself becoming a comic book artist? There were always a few copies of the Giles collections laying around at home, which I loved and I’m sure had a big influence on me as a child. I was also into TinTin and Asterix in a big way and didn’t discover American comics until I was around 13. My first memory of thinking about this as a career wasn’t until I started getting 2000AD in 1977. What was your first official gig as a comic artist? I did six issues of Zorro for Marvel, which was a trial by fire! I’d never drawn a real comic before so finding myself responsible for penciling and inking 24 pages a month was a huge shock. I fell behind deadline in the first month so a number of inkers were brought in to help. Also, the great and hugely admired Alex Toth did the last three covers, which not only took some pressure off but inspired me no end! I remember you saying you were drawing for Marvel and your art ended up being seen at DC. Were you able to keep drawing for Marvel, or did you have to commit fully to DC? I certainly kept the door to Marvel open but DC kept me very busy so I never really felt the need to go back to them. I’ve done a few little jobs for them since then but nothing major. Batman was too much of a pull. What really stood out to me in our conversation was when you mentioned you kept getting faxes for how Batman needed to be drawn. Was that common practice for established characters like Batman and did other artists go through a similar situation? The editorial team at the time had a very clear view of what Batman should be and tried to influence us into agreeing, by various methods including sending faxes with the words BATMAN IS BLACK written in bold marker pen! This was at the time Batman started to become very gloomy, dark and brooding, a grittier “real life” Batman. You mentioned a story about drawing the bat symbol on the sole of Batman’s foot because you believed Bruce Wayne was egotistical enough to do that and I agree. Could you go into more depth about the story and do you have any other funny stories like that? It made sense to me at the time, when presented with a panel showing the soles of his feet, that he would have a logo there. The guy’s ego puts the Bat logo on his chest, on his belt, even his car looks like a bat…he’s going to have the logo on the soles of his boots too! I never dreamed I’d receive complaints by disgruntled Bat fans, but some folks found it too outrageous to stay silent and told me I was nuts, explaining “bad guys would be able to follow him home by following his boot prints!” and such like. The next years Batman movie featured a Batmobile with Bat logo treads! Now we really could follow him home! As for more funny comic career stories, I could be here all day. Maybe I should write a book? I know you said you were inspired by French artist Moebius. What is it about his style that stands out for you? When I discovered Moebius I was at a stage in my artistic development where I’d found a direction and a solid understanding of what my work should be and how to create it. I’d been influenced by Giles, Herge, Arthur Rackham and then by the 2000AD greats like McMohan and Bolland, and my work (still only personal at this stage) reflected a love of clean line with lots of detail, my drawings were of fantastical and otherworldly places. Then I found copies of Heavy Metal and my world went pop! Who was this guy called Moebius who was already drawing the kind of things I loved to draw and in such a masterful way?! His work did more than just spoke to me, it screamed in my face “Moebius beat you to it!” It took me a while to recover, giving up drawing for a while because, well, what’s the point?! Moebius was already doing what I wanted to do and he was SO good at it. How did you start working on Judge Dredd and 2000AD? I cheated. Most folk spend months, even years, sending Tharg their sample pages begging for work, only to be rejected until their work matured enough to be accepted. I took a different path, via Marvel and DC and numerous superhero books. While on Batman I had the great pleasure of working with Alan Grant, who’s work I’d loved in 2000AD. After a seven year break from comics thanks to a life threatening double hiatus hernia, I mentioned to Alan that I’d love to do something for 2000AD. Next thing I know I’m drawing, inking and lettering my own story, scripted by Alan, called Big Robots. When you moved over to 2000AD, did you feel you had more creative freedom? Without a doubt. It was the major reason I wanted to work for them. I’m a good team player but after years of being disappointed time and again by the American conveyor belt system of creating comics, one that is time and money based, I needed to find more control over my work and an outlet for my creativity. I’ve always thought of 2000AD as a punk institution. One that demands that you’re creative, imaginative and capable of breaking out of boxes. What’s your opinion on the indie comic industry and do you think there’s more chance for an indie comic to be successful than say a decade or two decades ago? In the years that I was away from comics (1999-2007), two amazing things happened. Firstly, female people were now welcome in an industry that had been the sole reserve of the male. Secondly, there had been an explosion of small independent publishers and creators (some of whom were even female!). My first comic con after being away for so long was a huge wonderful surprise. It was genuinely thrilling to see so much diverse work being produced by folk of BOTH sexes who really seemed to care deeply about the medium. I’ve watched the indie market flourish over the last ten years since my return to comics, I’ve even worked on a few, and it’s something the industry seriously needs. The indie marked informs the “big three”, it proves that folk want diversity, something other than silly men and women in capes who constantly punch each other. The indie market helped the industry grow up a fair bit. Indie comics today are as viable as any other, often far more interesting, yet without the financial support of the big three they will always struggle. What’s your best advice for anyone who wants to become a comic book artist? Make sure it’s what you really really really want to do because it’s far more challenging, difficult and stressful than you could imagine! You have to be 100% dedicated to the point of obsession. You have to draw as much every day as you can and learn to draw absolutely everything. You have to have fun and enjoy drawing because your audience can read your mind! If you had fun drawing your page chances are that the reader will also have fun. Don’t spend your first comic payment in the pub! Flight. And not just restricted to the Earth! You can buy Batman: Death By Design now.